From elegant receptions and custom-designed wedding cakes to romantic bridal suites, Royal Sonesta New Orleans continues to be a top Big Easy wedding venue by taking care of every last detail. Known for its exceptional style and service, a wedding experience with Royal Sonesta New Orleans is flawlessly executed from start to finish. Do you dream of a day as big as your love? Let us create your storybook wedding. With its timeless and modern charm, Royal Sonesta New Orleans has set a new standard in romantic elegance. From the ambiance to experienced staff and culinary excellence, that special day will remain in the minds of guests for years to come. Offering the highest degree of personal service from a team of warm and experienced wedding professionals, Royal Sonesta New Orleans creates uniquely personal events. Whether it’s an intimate party or a magnificent ballroom gala for hundreds of guests, Royal Sonesta New Orleans will deliver a wedding to remember. 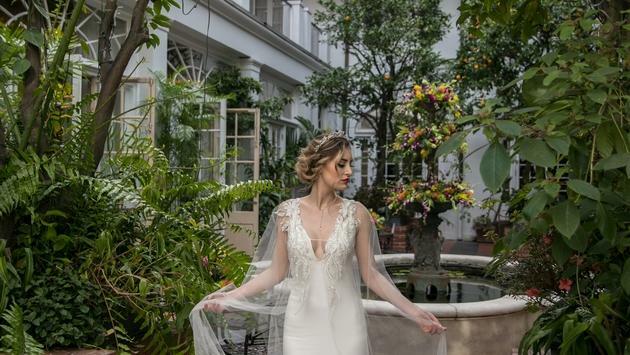 Many brides-to-be plan their ceremonies in the hotel’s lush courtyard, with receptions in the luxurious Fleur de Lis Suite. Both sites provide an unforgettable backdrop. The vibrant greenery and foliage of the courtyard; plus the neutral colors, wall sconces and sparkling chandeliers of the Fleur de Lis Suite provide an elegant glow for all occasions. The size and layout of the adjoining rooms and guest areas offer a variety of different styles and decor. A personal wedding professional will assist you in selecting the perfect menu for your reception. While there are a variety of wedding packages to suit every couple’s needs, customized menus can always be created. The hotel’s culinary program is well-known for its incomparable cuisine, with specialty menu items, signature drinks, lavish buffet dinners, and creative hors-d'oeuvres. Our team can make your visions a reality, all with a unique, personal and creative touch based on Sonesta's acclaimed “Food is Art” culinary philosophy. And offering 20,000 square feet of special event space, the hotel takes care of all dining and event needs in-house, from design to delivery. Not just a prime location for weddings, the hotel can accommodate every surrounding wedding event, including bridal showers, bachelor or bachelorette parties, rehearsal dinners, honeymoon stays and more. The hotel was even recently named the No. 1 Best Hotel in New Orleans for Bachelor & Bachelorette Parties. Overlooking world-renowned Bourbon Street, the Hospitality Suites are a favorite for small groups and hospitality functions. Located on the second and third floors of the hotel, these coveted suites are equipped with wet bars, plenty of entertainment space for groups of 50-150 people and French doors that open onto spacious, covered, wrought iron balconies with a bird’s eye view of Bourbon, Conti or Bienville Streets. Within the hotel, Royal Sonesta New Orleans offers the best of the city all under one roof, with Restaurant R’evolution, Bar R’evolution, The Jazz Playhouse, Desire Oyster Bar, Le Booze, and PJ’s Coffee Café. In addition, guests can stay on-property for the experience of a lifetime. For an added experience, the exclusive R Club Level is the height of luxury for bridal suites, family members and wedding party room accommodations. Invite your guests to the heart of the French Quarter for a wedding or event they’ll never forget. For more information about hosting your special day at Royal Sonesta New Orleans and to learn more about its world-class staff and amenities, visit our website. For the latest updates, follow along on Facebook, Twitter, and Instagram. Brigette T. Folse is responsible for the leadership, effectiveness and productivity of the Royal Sonesta New Orleans’ sales organization. Folse has over two decades of experience in the hospitality industry that includes overseeing several major hotel openings. Before joining the Royal Sonesta New Orleans, Folse served as the associate director of sales for the Hyatt Regency New Orleans. While at Loews Hotels, Folse served as associate director of sales at the Loews Coronado Bay Resort & Spa in San Diego and as the national sales manager for the opening of Loews New Orleans. Folse has held additional managerial positions at both the J.W. Marriott and Hotel Monaco in New Orleans.